The Hanging Church is the most important and the oldest Church in Egypt. The name “Hanging Church” is actually the name of Saint Virgin Mary’s Coptic Orthodox Church. It is even referred to as the suspended church “Al-Muallaqah”. It was built on the southern gate of the Babylon fortress, which was the Roman fortress in Coptic Cairo and that is why it is called “The Hanging Church”.The Hanging Church is also dedicated to Saint Mary that is why it is called Saint Virgin Mary’s church. 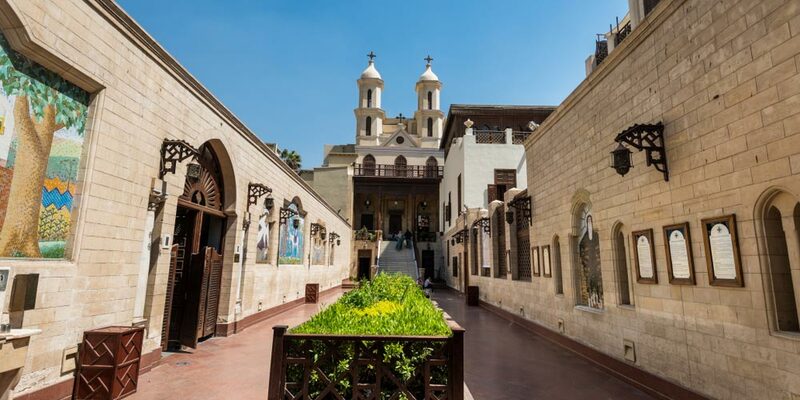 This church has fame and popularity among most of the Copts & tourists through spending their Cairo day tours. There are also other names of The Hanging Church including “The Church of Steps” because there are some steps you have to take in order to reach the main gate of the church and it was also called, “The Church of Columns” because Saint Mary herself appeared faithful on one of its columns. The Hanging Church was built in the 7th century and has been rebuilt many times since then including a major rebuild under the supervising of Patriarch Abraham in the 10th century. The hanging church became the official residence of the Coptic Patriarchs of Alexandria in the 11th century. The entrance gate of the Hanging Church is well decorated on Mary Girgis Street. The gate leads to an open courtyard from where there are 29 steps to the church. At the top of the stairs, there are three wooden doors, which are decorated with geometric patterns. The right section of the sanctuary is considered the original one. 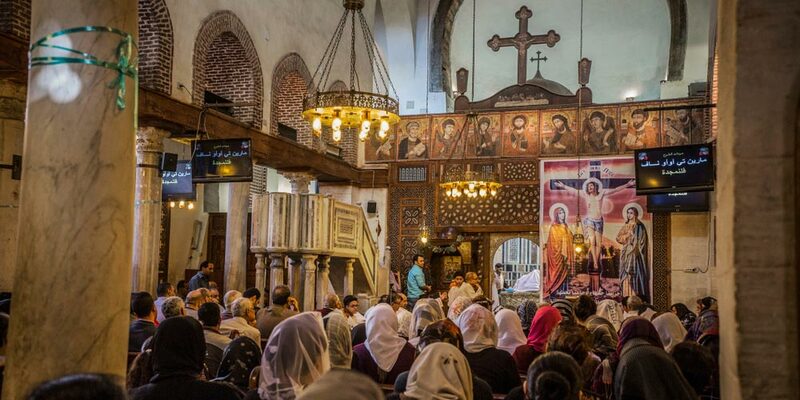 The hanging church is considered the most beautiful Egyptian church because of its marble pulpit, murals, and icons, in addition, the fact that its timber roof recalls Noah’s Ark. The marble pulpit of The hanging church is surmounted by 13 pillars that depict Jesus with other 12 disciples. One of the pillars is black, which represents Judas, another one is grey representing Thomas and the oldest icon dates back to the 8th century. Many of the artifacts that were inside the church are now displayed in the Coptic Museum just like a lintel showing Christ’s entry into Jerusalem from the 5th or the 6th century. 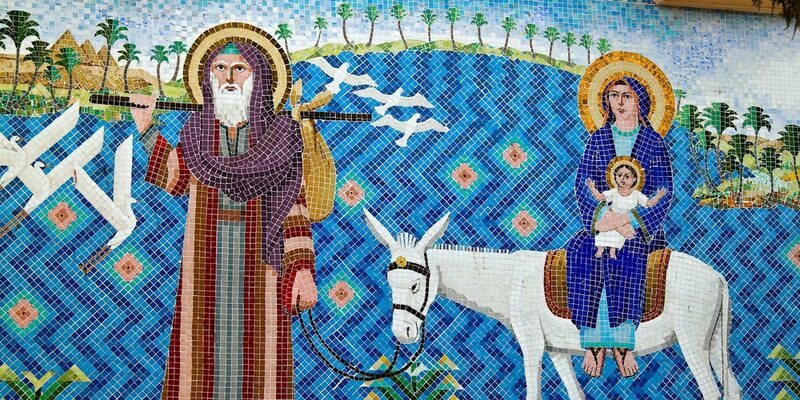 There are three sanctuaries dedicated to the Virgin Mary, St. George, and St. John the Baptist. The central iconostasis dates from the 13th century, which is made of ebony inlaid with ivory. It is carved with geometric designs and crosses. There are 110 icons inside the hanging church and most of them date back to the 18th century. There is an icon in the center depicts the enthroning of the Christ with Virgin Mary & the Archangel Gabriel to his right and there are John the Baptist, St. Paul, and the Archangel Michael to his left. There is a screen on the left that is surmounted by 17 icons, which depict the martyrdom of St. George, whereas the screen on the right has a cruciform pattern. The Hanging Church has huge importance for all the Coptic Christians in Cairo. It was the first church to be built in the Basilica style. The hanging church is the site of many reported Marian apparitions, who is said to have appeared in a dream to Pope Abraham in the 970s. King Louis XIV sent the French monk Vansleb in 1671 to study the state of the churches in Egypt. Monk Vansleb saw some inscriptions on one wall of the hanging church, which was written by the hand of the amazing Muslim commander, Amr Ibn El-As. Amr Ibn El-As asks all Muslim People to treat this church with respect. So this church acts as a very important Christian symbol that holds inside a great Muslim message. 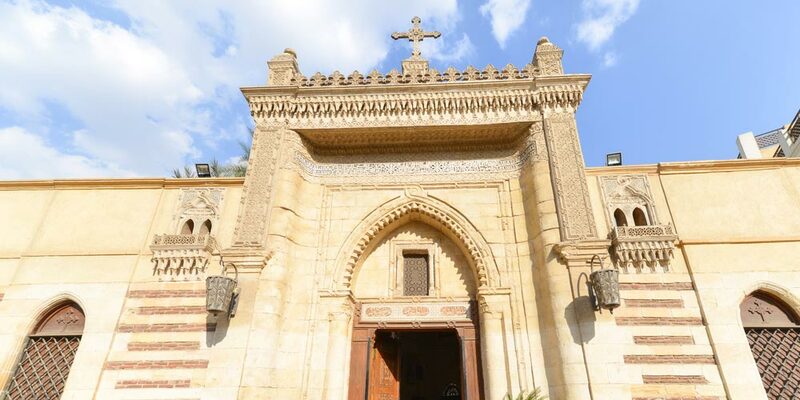 The seat of the Coptic Orthodox pop of Alexandria was Alexandria, but in 1047 after the Muslim conquest of Egypt, the ruling power moved from Alexandria to Cairo and became the official residence of the Coptic Pope to the hanging church. To construct a fundament of the hanging church, logs of palm trees and layers of stones were constructed above the Roman fortress ruins. Its wooden roof takes the shape of Noah’s ark. The last modification of the church was made was made by Obeid Bin Khozam in 1755 AD and now it measures 23.5m in length, 18.5 in width and 9.5m in height. In the middle of the southern aisle, there is a door that leads to a small church and inside this small church, there is a baptistery from the fifth century. Inside the church, there are 7 altars; three of them are located in the main sanctuary and another three are suited in the right sanctuary. Among them, there is an altar of Tecla Hymanot, who was the Ethiopian Saint. Finally, If you fond of Egypt and love to visit its attractions, check our Egypt tour packages which enable you to find your chance in the symphony of Cairo’s busy streets. Visit Alexandria “Egypt’s Second Capital”, and discover the beauty of Red Sea represented in Hurghada & Sharm El Sheik.